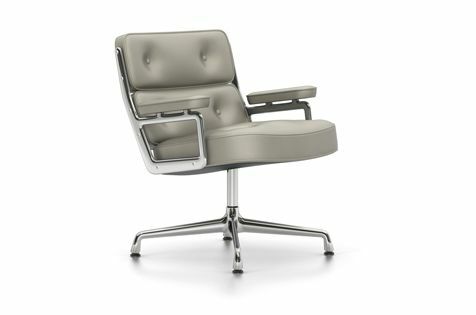 The structural design of the Lobby Chair makes it comparable to the Lounge Chair in terms of comfort. It consists of three individual cushions joined together by aluminium side frames. The armchair was originally conceived to furnish lobby areas in New York's Time Life Building. In the following years, different versions were created that all have one fundamental thing in common: exceptional comfort. The Lobby Chair is available in three versions: the ES 104 office swivel chair, the ES 108 conference chair on glides, and the wider and lower ES 105 armchair for lounges and waiting areas. Side frames in chrome-plated die-cast aluminium. Cushion elements covered in leather. Fixed seat height, swivel seat. Four-star base of chromed, die-cast aluminium.